Flow cytometry is technology that measures cells/particles moving in a fluidics stream through a laser beam at the point of interrogation. It measures relative light scattering and fluorescence. The flow cytometer consists of a light source, collection optics — mirrors, lenses and filters — electronics and computers that translate analog signals to digital signals. The light source is a laser that emits coherent light at a specified wavelength. Scattered light based on the size of the cells is collected by lenses in front of the light source — forward scatter — and light scattered based on internal complexity of cells is collected at right angles — side scatter. Emitted fluorescent light is collected by series of optics, beam splitters and filters that help measure fluorescence of specific bands. Flow cytometers uses several types of laser. For example, gas lasers — like helium-neon, argon, helium-cadmium; solid state lasers — like NdYAG; dye lasers; or semi-conductor lasers. 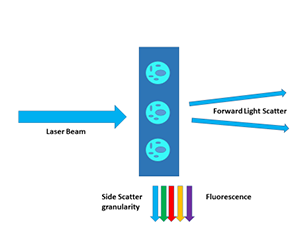 The application and availability of lasers and filters (flow cytometer configuration) determines the choice of fluorochrome to be used for a particular experiment. 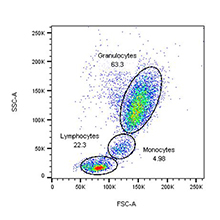 The applications of flow cytometry are numerous, and this has led to widespread use of these instruments in the biological and medical fields. To be the premier cell analysis resource for the community of Principal Investigators (PIs) at University of Arizona College of Medicine - Phoenix, and local research institutions. The goal is to advance health care and innovation through an exchange of information between PIs, students, and staff in the development of new, cutting-edge applications of flow cytometry technology. 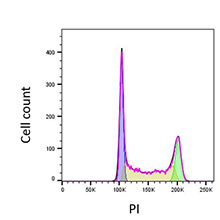 The Flow Cytometry Core provides expertise, training/education, personnel and instrumentation, to assist users in multi-parametric flow cytometry, and fluorescence-activated cell sorting (FACS) for both basic and clinical research. The core Director can provide help with multicolor/multiparameter panel designing, design of experiments, as well as to develop and implement new applications/assays. The core staff is available to provide assistance in sample preparation, staining, data acquisition and analysis. The Flow Cytometry Core offers an array of services across the spectrum of translational research, from basic medical science to clinical trials. These services include experimental design, sample preparation, data analysis and consultation and many other types of collaborative work. HonorHealth – Developing an early detection marker using flow cytometry and NGS technology for pneumonia causing pathogens in intubated trauma patients. 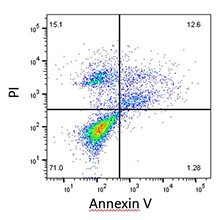 Amnio Technology – Stem cell biomarker for amniotic fluid. Cytometric bead array CBA technology.